New day. New track forecast. At 5 AM this morning, Florence was 200 miles SE of Wilmington NC, heading NW at 15 mph. The official 5 AM intensity was 110 mph; although the recon aircraft in the hurricane (On purpose!) reported 85 knots (97.8 mph; You’re welcome.) The aircraft also reported a degraded eyewall. Florence is weakening over cooler, upwelled shelf water and interacting with land. Intensity is weakening but the extent of tropical storm force wind is expanding; a conservation of momentum requirement. The radius of tropical storm force winds has expanded out to 200 miles from the center of the hurricane. Florence makes landfall at Wilmington tonight at 2 AM. 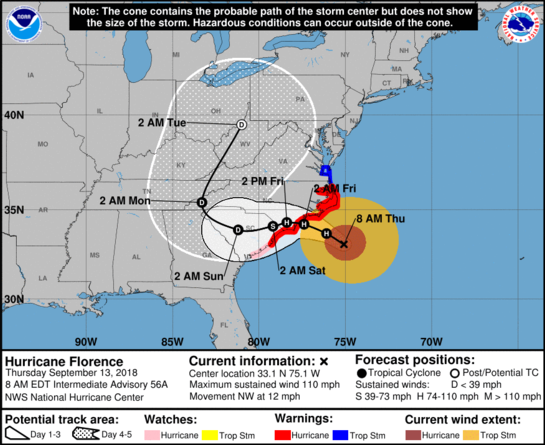 At near stall speed over NC for 24 hours, Florence drop 20-40 inches of rain over eastern NC. Florence then tracks slowly west, weakening to a tropical storm and splashes into Horry County 2 AM Saturday morning. Florence drops 8-15 inches rain on the Pee Dee and will cross into the State with 50 mph winds gusting to 70. Expect isolated short lived tornadoes right of Florence’s track ( Not every one gets one…) on Saturday as Florence tracks west south of I-20. Florence becomes a tropical depression over Columbia by 10 PM Saturday with 30-35 mph sustained winds and higher gusts in the decaying rainbands. Florence rapidly exits the State to the northwest, under the cover of darkness late Sunday night. TS Isaac direct to Caribbean. 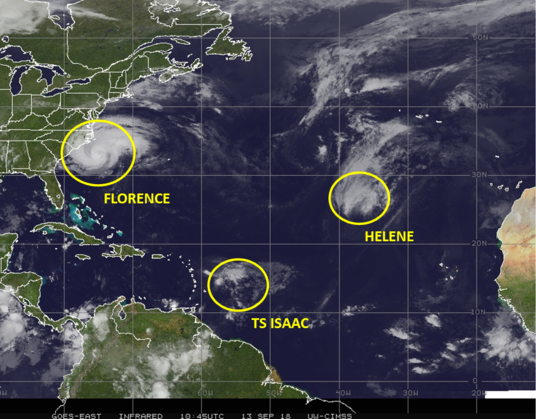 Hurricane (barely…) Helene: fish storm. Thank you for the privilege of serving you in Columbia. Your feedback and assistance is critical in ensuring your voice is heard in our state government. If you have ideas on issues you want me to share with the rest of the General Assembly, or if you need assistance in any way, please don’t hesitate to give me a call at 864-529-2860 or email me at eddietallon@schouse.gov. Remember, you can go to www.schouse.gov, click on my name and see how I have voted on each and every issue before the house. You can also see any bills that I have sponsored or co-sponsored.